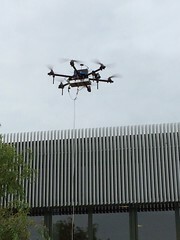 The helicopter drone has contributed with a unique overview of the traffic around the schools in Aalborg. Aalborg wants to be the city with the best traffic safety around schools. Therefore AalborgMunicipality together with COWI has actively started using new innovative analysis tools such as GoPro cameras and drones. This way the traffic safety work by the schools in the municipality takes its starting point (amongst other places) in the students’ experiences of the traffic. In November 2013 Aalborg Municipality was chosen as one of the Danish Road Directorate’s Traffic Safety Cities 2014. The overall vision of the project is to make Aalborg the city in Denmark with the best road safety around schools. Three schools were chosen and the goal here is to bring down the number of injured children and youngsters to zero as well as to make more children ’self-transporting’ so that they learn how to manage in traffic from an early age – which will hopefully make them behave better in traffic in the future. Also, one of the sub-goals is to try out new and innovative attempts to build up a new concept for the shaping of school roads. › Video recordings of chosen students’ way to school by attaching a GoPro camera on their bicycle helmet. › Drone recordings of the traffic in the area around the school. Recordings with GoPro camera by bicyclists have shown examples of several situations where cyclists either react in an unsuitable way themselves or have to adapt as a consequence of the behavior of other road users. Recordings with GoPro camera can also very well be used where an insight into the students’ experiences of traffic is desired – and not least how the students handle the conflicts they inevitably get into on their way to school. The insight into the behavior of the students in connection with their cycle ride to school also offers the opportunity to give ideas concerning what the traffic education at the schools could focus on. Buses and large vehicles often make children on bicycles more insecure. The use of drones to give a thorough overview of the traffic in the area around the schools has not been done in Denmark before and the recordings did to a very high extent give the expected overview. The obvious advantages of this tool when it comes to for example inspections and surveys are that all situations are documented and it is possible to observe many road users at the same time just as it is easy to analyse ’near misses’. Afterwards, the analysis is meant to create the basis for physical changes leading to better traffic safety on the school roads in Aalborg Municipality.